Paul Menard and the No. 21 Motorcraft/Quick Lane team came away with a 17th-place finish after a long, hard night in the Bojangles Southern 500 at Darlington Raceway. Menard started the race from 14th place but fell back early due to contact related to some tight-quarters racing on the Track Too Tough To Tame. The damage meant that extra time was needed on pit stops to repair the damage, and that put him at the back of the pack for several restarts. And at Darlington, the back of the pack is a tough place to race. By the end of the race’s second 100-lap stage, Menard had fallen two laps down to leader Kyle Larson but made up one of those laps with a daring pass of Larson with two laps remaining that stage. More damage and more repairs led to Menard falling three laps down at one point in the final stage, but the Motorcraft/Quick Lane team employed the wave-around on two late cautions to make up two laps and line up 17th, just one lap down, for what turned out to be the race’s final restart. Menard held on to his position, but without another caution he was unable to rejoin the lead lap and wound up 17th. Eddie Wood said having to restart at the rear of the pack on several restarts made Menard’s job a difficult one. “The potential for getting collected in a wreck is greater in that situation, and it doesn’t take long for the leaders to run you down,” Wood said. “It would have been interesting to get another caution at the end and see what we could do, but that didn’t happen. 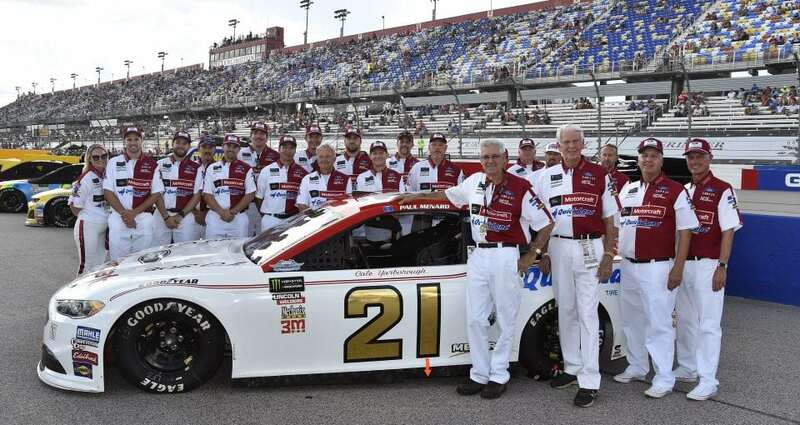 Wood said it was encouraging to see Team Penske, which shares an alliance with his Wood Brothers team, score a 1-2 finish and deliver Roger Penske his first Southern 500 trophy since 1975 when Bobby Allison drove Penske’s AMC Matador to victory at NASCAR’s original superspeedway. Menard and the No. 21 team return to the track next weekend for the Brickyard 400 at Indianapolis Motor Speedway, the final event in the 26-race regular season. Menard needs a victory at Indianapolis, where he won in 2011, to be among the 16 drivers who will start the 10-race, season-ending Playoffs.